One of my biggest weaknesses is sweets. For the longest time I craved just more salty things, but ever since I was pregnant with the girls sweets have been my go to. I would rather eat a slice of Key Lime Pie over a box of french fries any day. 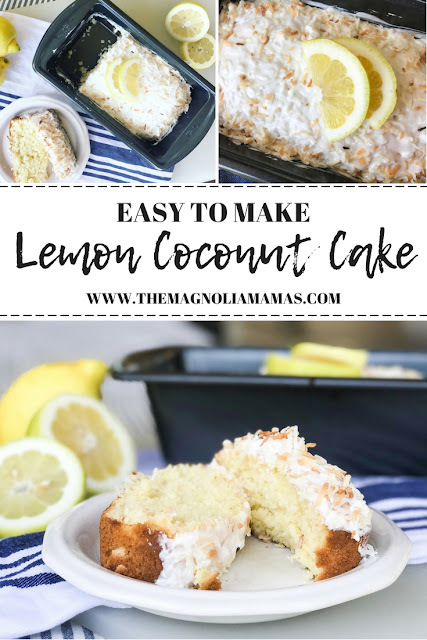 Over the weekend I was in the mood to do a little baking and had been tossing around the idea of something with lemon or coconut, and then thought why not combine the two? In true form, I did a quick Pinterest search of a few recipes and then narrowed it down, and combined my favorites into the easiest possible. It could have gone either really well or really bad, but in the end I'm happy to report it was oh so yummy! It was little a little bit of southern summer right in our mouths. Give it a try and enjoy the sunshine yourselves! Preheat oven to 350 degrees. Grease the bottom of a large loaf pan. (I use this 9.25 x 5.25 loaf pan). In a large bowl mix together eggs, sugar, butter and oil until well blended. Stir in vanilla extract. Set aside. In another bowl stir together flour, corn starch, baking powder, baking soda, and salt. Set aside. In a smaller bowl mix together milk, coconut milk, lemon juice and yogurt. In your large bowl containing the egg mixture add in the the powdered mixture and your yogurt mixture. Once well blended add in the coconut. Place batter in loaf pan and bake for approximately 30 to 35 minutes. While your cake is baking mix together in a small bowl your coconut flakes and whipped buttercream for the frosting. Once the cake is cooled add frosting and top with toasted coconut. 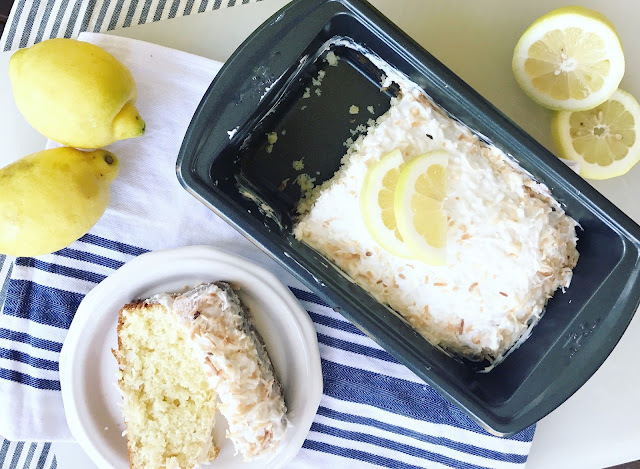 Do you have a summer recipe that you just love? Share with us! We are always looking to add a little something to our cookbooks. Occasionally we decide to take a hiatus from our summer of no cooking and give a break to the hubbies manning the grill.